HOPELESSNESS, the premiere release from ANOHNI (formerly known as Antony Hegarty of Antony and The Johnsons), is an electro-protest album befitting our times. With her force-of-nature voice and musical collaborators, Oneohtrix Point Never and Hudson Mohawke, ANOHNI has taken some of society’s most problematic issues and paraded them through our ears for thorough consumption and thoughtful consideration. 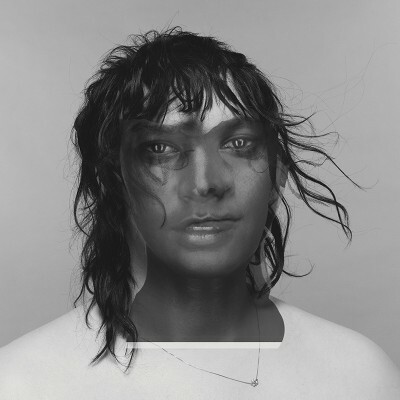 The cover art above, with a background of brooding grey, depicts ANOHNI in a white T-shirt with long, black, scraggly hair and a cut-out face overlapping hers—perhaps addressing the “masks” that society often forces upon transgender individuals; ANOHNI herself is transgender. This image, ANOHNI’s face, with its beautiful yet unsettling appearance, calls into question the purpose of gender limitations as imposed by society. The artist’s name and album’s title are scrawled in a bold and somewhat rune-like script—speaking to a kind of nonviolent yet fierce and unwavering statement of existence and purpose. The cover, as a whole, compels one toward an unsettled melancholy, hopelessly hopeful—really quite in line with the tone of the album. HOPELESSNESS opens with the single “Drone Bomb Me.” With a chorus of synths, percussive water-droplet sounds, spatial atmospheric noise and ANOHNI’s incredible range working together, the song explores the issue of drone bombing with the speaker pleading the drone, which has taken so much from them already, to blow their “crystal guts” out of their body. “Watch Me”—definitely my favorite—uses an ’80s prom vibe (read, “Forever Young” by Alphaville) as a means to address the sensual and predatory relationship between the government’s citizen surveillance and the surveyed. ANOHNI croons, “Daddy, I know you love me, because you are always watching me.” Church organs paint the moody and reverent atmosphere of “I Don’t Love You Anymore”—one of the album’s few tracks that isn’t obviously political. It is a slow-burning song that, inexplicably, seems to hold a level of guilt instead of power, as if reluctantly speaking those final though necessary words. It eventually builds into an emotive ecstasy, both vocally and musically, finding that sweet spot between finality and freedom. “Obama” is a minimalist song that speaks to the failings of our beloved POTUS. With no tonal variation to the vamping vocals and droning synths that politely crackle in the background, the song is as wearing as it is bleak—it is the listener’s test, the line that few will cross. Similar to some Postal Service instrumentals, “Crisis” plays out in bittersweet despondency. It is a natural bookend to the album in that it presents the drone’s (or drone controller’s) side of “Drone Bomb Me”—an unmanageable desire to kill intermingled with regret for said desire. The album closes with “Marrow,” which features a light piano, some running synth blips, and ANOHNI exploring the upper parts of her range. For an album that is based around this boisterous presence, pushing back at society’s boundaries and the governmental establishment wherever it can, “Marrow” is something of an underwhelming finale.